I have this little red hummingbird feeder, that hangs up in my garden. It’s just the plastic kind, like you could find at any garden store. I can see it through my window now, hanging beneath frost-tipped branches, dusted with snow. You can see it from the road. It’s possible that this is a bit embarrassing. A more accomplished homesteader probably would have taken it down months ago. Before the sugar water froze solid and the plastic started to crack. But the truth is, I’m not that great of a homesteader. This is my very first full winter, in the woods. And for the month of February I live here all by myself, with my three kids. The would-be mountain man who brought me here is away for a whole month, in a place that seems fantastically far away. With blue water and gold beaches, working long and stressful hours for a movie star. And the oldtimers promised us deep snow -- snow drifting up to the windows -- but it never came. The climate is changing. Instead of snow pack we have the promise of another parched dry summer. It snows mere inches, at intervals. And it melts and freezes and melts and freezes, and now the surface of the garden is thick with ice and ground-in dirt. The snow that was once pure and heaven sent is a canvas of impurities. I’m ready for the melt. Maybe a wiser woman would dig in and ration her energy. Maybe a wiser woman would be friends with the calendar, which shows quite clearly two months at least before the hummingbirds return. Two months of melt and freeze and melt and freeze and even after that the muddy tire tracks and spring hailstorms and chill. But the truth is, I’m not a very wise woman. I like to spend it all. I spend my hope and I spend my adoration. 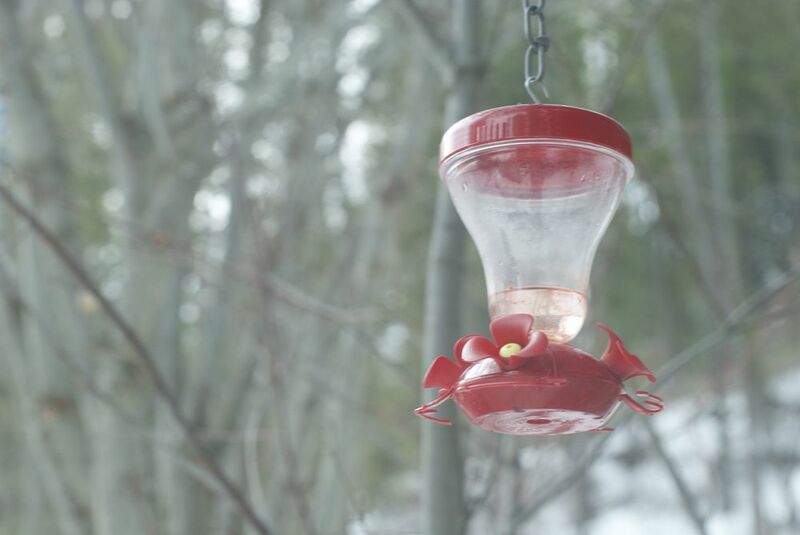 I keep a cracked red plastic hummingbird feeder as my very own winter flower. I can see it through my window. And you can see it from the road. And it’s like a promise. I have a date with the hummingbirds, don’t you know? At the hour at which this frozen hill comes back to life, I’ll be there. It’s a promise. I will sit on a packing blanket and do my meditation in the garden. (Not much meditating in the garden is happening in February.) I will feed the birds and water the flowers. I will remember a spring that isn’t coming yet, for months. But I’m not a very wise, or careful, woman. I have so little, here in the woods, alone in February. I have so little that I have to spend it all. In my bright red plastic hummingbird feeder, standing so audaciously in quite the wrong outfit for the season, I am keeping only hope. Esther Emery used to direct stage plays in Southern California. But that was a long time ago. These days she is pretty much a runaway, living off grid in a yurt and tending to three acres of near wilderness in the foothills of the Rocky Mountains. She writes about faith and rebellion and trying to live a totally free life at www.estheremery.com, and is also the author of the free, inspirational ebook Unleash Your Wild. Connect with her on Twitter @EstherEmery.